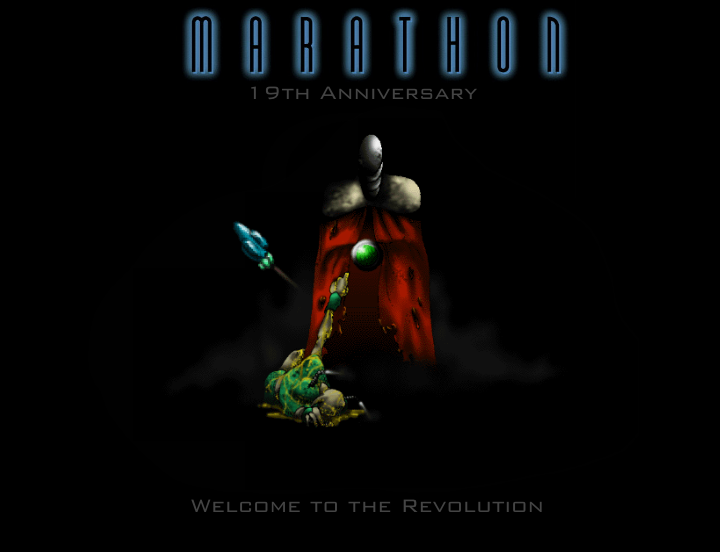 Posted By: PerseusSpartacus Date: 12/20/13 9:21 p.m.
Marathon was released on this day 19 years ago. What has followed is a story of intrigue, mystery, and rampancy. We continue to plunge into the depths of Marathon's Story, hoping to find new and interesting tidbits of information as to Bungie's intentions. To a large degree we have succeeded, but there will never be a time when we say 'We have unraveled all of Marathon's secrets!' Such is the way of life - we will never understand our world fully. Questions shall always linger. This is why we love Marathon. I think the logo adds a little more depth, but I think I might prefer if it were a tad less noticeable. A more themed banner, designed to imitate the terminals which follow us throughout the game. A classic screenshot of Marathon, with fade for good measure. Then again, some people may get frustrated that they can't tell that purple guy that his Flamethrower isn't doing any good. A larger, more elegant banner, with an image borrowed from a chapter screen of the game itself, not to mention a caption borrowed from the name of the level to which the chapter screen belongs. I love that image - it just captures the feel of the game so well for me. So, tell me which one was your favorite, and if you want, I can post some more banners I did following in the example of that last one, albeit perhaps not as good (IMO). 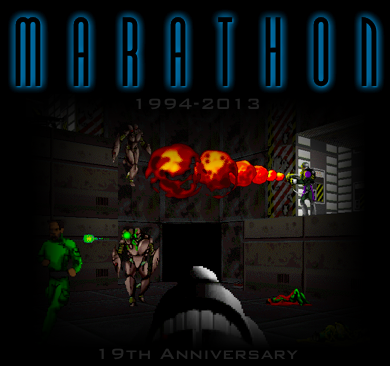 Happy Anniversary, Marathon! PerseusSpartacus 12/20/13 9:21 p.m.
Re: Happy Anniversary, Marathon! cB557 12/21/13 2:14 a.m.
Re: Happy Anniversary, Marathon! Hokuto 12/21/13 3:45 a.m.
Re: Happy Anniversary, Marathon! PerseusSpartacus 12/21/13 8:01 a.m.
Re: Happy Anniversary, Marathon! VikingBoyBilly 12/21/13 10:13 a.m.